The news out of the federal government hasn't been too good this summer, but we have finally found something positive and promising to report. Registration is now open for the 2017 Congressional App Challenge, an effort to encourage kids to learn how to code, through annual district-wide competitions hosted by Members of Congress for their districts. The Challenge began in 2014 with a pilot program in which more than 80 members of Congress participated. By 2015, the House appointed the Internet Education Foundation to be the program's non-governmental sponsor and numerous companies -- tech and otherwise -- are now involved. In its first two years, the program included nearly 4,000 students from 33 states. Over 1,150 apps were created -- over 30 percent of which were created by girls. The 2017 competition launched on July 26th and runs thorough November 1, 2017. This year more than 165 Members of Congress are participating. Each Congressional District selects a local winner; winners will be announced during Computer Science Education Week in early December. The competition has no age restrictions, except that students may not have yet graduated from high school. Entrants (or at least some of the members if entrants are part of a team) must be from the Congressional District to which they apply. The App Challenge isn't just aimed at experienced coders. The website for the program offers resources that can help students who are new to coding to learn the necessary skills. All District winners will have their apps displayed in the U.S. Capitol. 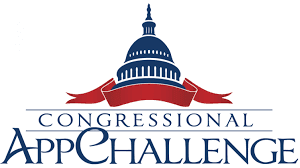 Find out if your Representative is participating in the App Challenge.